We previously wrote about some services that tried to aggregate and visualize social media discussions on politics in Singapore and Korea. And now two digital agencies in Indonesia - Tridaya and Mediawave - have made Politicawave.com, a website that gives visitors data analytics about Indonesian conversations in social media about politics. 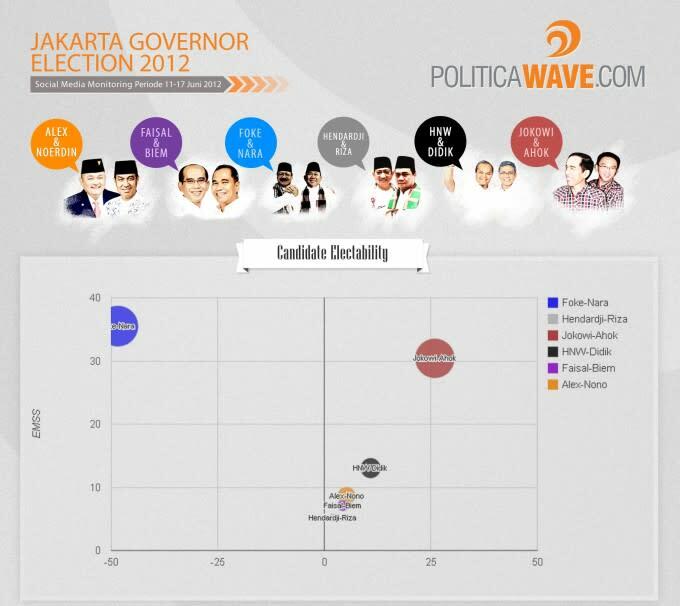 Published to coincide with build up to Jakarta’s governor elections tomorrow, Politicawave claims to monitor millions of conversations in major social media like Twitter and Facebook, and some other popular local sites such as Blog Detik, Kaskus, and Kompas. Politicawave shows some important indicators such as trends in awareness, candidate electability, shared concerns, and media trends. It even has a page dedicated to show how these indicators are measured. Although the site currently does not display any very recent analytics on its website in order to comply with the local election committee’s regulations to not publish any survey-related materials between July 9th and 11th, you can download several useful infographics that they've previously released (as pictured above). With Jakarta having most of Indonesia’s internet users, it is interesting to see how social media sentiment towards candidates will reflect on the actual local election results tomorrow.